Have package prices increased for the 2019-20 season? Does it cost more to alter my ticket package or relocate my seats? Will I have to make a payment for my seats when I renew? Why do I have to enter my credit card again? Can I upgrade from a Mini Pack to a Full Season Package and still keep my same seat? Can I downgrade from a Full Season Package to a Mini Pack and still keep my same seat? Can I add or remove seats on my account? Will I get access to better seat locations if I wait before completing my seat relocation? I want to relocate to wheelchair seating. Can I do this online? How will I select my regular season seat(s) included in the Prime Package? What if I only want to relocate my seats for the Prime Package? How will the order for altering ticket packages and relocating seats be determined? When will I receive Seat Pass Card? When the Mini Pack schedule is released, will I be able to change to a different package if my current selection does not work for my schedule? Do I have a Ticket Sales Representative assigned to my account who can help me if I have additional questions? I am a 21 or 30 Game Mini Pack Holder. How do I relocate my seats or alter my ticket package? What are the benefits of being a Moose Package Holder? What if I have a conflict with my schedule and there is a game in my package that I am not able to attend? Prices for Manitoba Moose Seat Holders will remain the same for the third straight season! The per game per seat price for Moose Seat Holders will be: P1 – $26.25, P2 – $21 and P3 – $15.75. The price of the Moose playoff game included with your 2019-20 Moose Regular Season Seats will be the same as the price of a Moose regular season game. No, there is no additional cost to alter your package or relocate your seats. Visit www.moosehockey.com/packages to view the 2019-20 Manitoba Moose pricing chart and seating map. No payments will be processed when you renew your 2019-20 package. Your first payment will be processed on or about April 15, 2019. Payment Plan – The Moose Monthly Payment plan is spread out over 12 months. Monthly payments are processed on, or about, the 15th of each month starting April 15th, 2019 and ending March 15th, 2020 (Direct Withdrawal or Credit Card). Note there is a 2% administration fee applied to Monthly Payment plans. We require all Seat Holders to keep valid credit card information on file, regardless of the method of payment used for their account. All cards are encrypted for privacy and safety reasons. Yes, however, the likelihood of keeping your same seat will be subject to Full Season Seat Holders who wish to purchase your seat location for a Full Season Package. In the event this occurs, you will be required to relocate to a different seat location. It is unlikely as the best seats will be made available right from the beginning of the seat relocation process. However, there is the possibility that additional seat locations may become available if Season Seat Holders choose to alter their ticket packages. We anticipate the 2019-20 regular season schedule to be released during the month of July. The regular season Prime Package will be communicated shortly after the release of the 2019-20 regular season schedule. What if I want to relocate my seats for the Prime Package? You cannot choose seats for the Prime Package as part of the relocation process. The only way to guarantee your seats for the Prime Package at this time is to purchase a 2019-20 Full Season Package. The Prime Package will be announced shortly after the release of the 2019-20 AHL schedule (expected to be released during the month of July). The order will be based on the date and time you renewed your ticket package. Seat Holders who completed their renewal earlier in the process will be given priority access to alter their account, including seat relocation. When will I receive my Moose Pass Cards? Your 2019-20 Manitoba Moose Pass Cards will be mailed to you in the fall. There will also be an opportunity for Moose Seat Holders to pick their Moose Pass Cards up at the Winnipeg Jets Fan Fest in September. Yes, currently we anticipate communicating the 4 Mini Pack options for the 2019-20 season to all Mini Pack holders in July. If the Mini Pack option you initially selected does not work for your schedule, you will have the opportunity to choose the Mini Pack that best fits your needs. Do I have a Manitoba Moose Account Service Representative assigned to my account who can help me if I have additional questions? I am a 21 or 30 Game Mini Pack Holder. How do I alter my ticket package? As a Moose seat holder, you will have access to our digital ticketing platform, which gives you convenient, 24/7 online access to your seats using your Manitoba Moose Account. You can log in to your Manitoba Moose account via www.moosehockey.com. Once you are logged in you can take advantage of the many benefits of your Manitoba Moose Digital Ticketing Platform. The Manitoba Moose will introduce three new benefits for seat holders during the 2019/20 season! Ticket Trade – You will be able to trade tickets prior to a game you cannot attend for a game you can attend, this allows you flexibility by attending games that are not included in your package or having multiple seats for a game you can attend. The Ticket Trade Program allows you to customize your package to fit your schedule. Seat Holder of the Game – One Manitoba Moose seat holder per game will be recognized on the scoreboard and receive a special Manitoba Moose prize package – just for being a Moose Seat Holder! Savings – As a Moose Seat holder you are able to save over $12 per game per seat compared to individual game ticket prices. Jets Gear Discount – Moose Seat Holders are entitled to 15% off their entire purchase at Jets Gear Stores. Online Monthly Manitoba Moose Seat Holder – Every month during the year, the Manitoba Moose will send a special online contest link exclusive for Moose Seat Holders – during 2019/20 Moose Seat Holders will be able to win great prizes! Family Holiday Skate – During the December 2019 Holiday Season – you will receive an exclusive invite to participate in a Holiday Family Skate on the ice at Bell MTS Place where the Moose and Jets play! Ticket Forwarding – You will be able to Forward tickets to friends, family, staff or clients without physically distributing tickets. The recipients will then be able to load the tickets to their mobile device or print at home. Please visit www.MooseHockey.com/UserGuide for additional details! Donate – You will be able to Donate tickets to games you are not able to attend. The tickets will be donated to a youth serving association that is partnered with the True North Youth Foundation. In return for you donation a tax receipt will be sent to you for the package value of the ticket. Please visit www.MooseHockey.com/UserGuide for additional details! Opportunity to Save on Select Winnipeg Jets Games – During the 2019/20 season you will receive a communication with the opportunity to purchase individual Winnipeg Jets tickets at a discount compared to the general public. 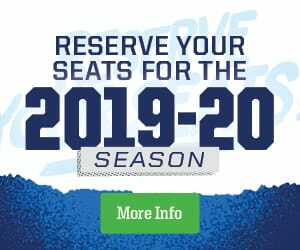 Exclusive Event – The Manitoba Moose will invite all Moose Seat Holders to an exclusive event during the 2019/20 Season. Ticket Trade – You will be able to trade tickets prior to a game you cannot attend for a game you can attend, this allows you flexibility by attending games that are not included in your package or having multiple seats for a game you can attend. Please visit www.MooseHockey.com/UserGuide for additional details! Donate – You will be able to Donate seats to games you are not able to attend. The tickets will be donated to a youth serving association that is partnered with the True North Youth Foundation. In return for your donation a tax receipt will be sent to you for the package value of the ticket. Please visit www.MooseHockey.com/UserGuide for additional details! Ticket Forwarding – You will be able to forward seats to friends, family, staff or clients without physically distributing tickets. The recipients will then be able to load the tickets to their mobile device or print at home. Please visit www.MooseHockey.com/UserGuide for additional details!